Brushing your teeth is important. Just ask Doraemon, the robot cat from the future! 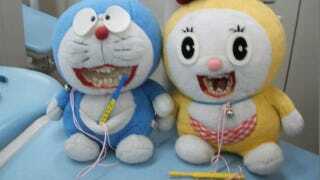 A Japanese dentist decided that Doraemon (and his sister Dorami) plush toys would make perfect models for teaching brushing, so the good doctor added phony teeth and a Joker smile. The result is horrifying.